FOREWORD: In recent years, I have created blog pages – essentially my journal – of my cycling trips abroad. [Most of those are still visible on this site.] I did these in “real time,” creating and posting pages each evening during the course of my trips. Because of the anticipated lack of ready access to reliable internet service on my Cuba trip this year, I did not post as I went, but I did keep a reasonable detailed set of notes, from which I am now creating this blog, having returned home after a delightful trip during which I made new friends, got reacquainted with some old friends, and learned a great deal about this wonderful country. Unable to check in on-line because my itinerary included Cuba, I dutifully heeded American Airlines’ suggestion that I be at the airport three hours before departure. That proved completely unnecessary, since I got through check in and security in less than an hour before my 10:35 pm flight. Aware that I had an extremely long layover in Miami, I purchased a one-day pass to American’s lounge, the Admiral’s Club, knowing that it would be valid in Miami as well. 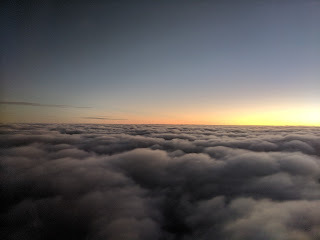 I awoke on the plane to a beautiful sunrise above a thick blanket of clouds. After landing at 7 am, I headed for the Admiral’s Club where I nibbled on snacks, read the newspapers and watched a movie on my iPad while waiting for my 2:30 departure for Santa Clara, Cuba. I got to the gate early, having some uncertainty about how the “document check” procedure would work, but it turned out to be painless. I had already purchased my visa, and the airline simply stamped my boarding pass as documentation that I had the needed medical insurance. [I have no idea how that insurance would have worked, had I needed to use it.] 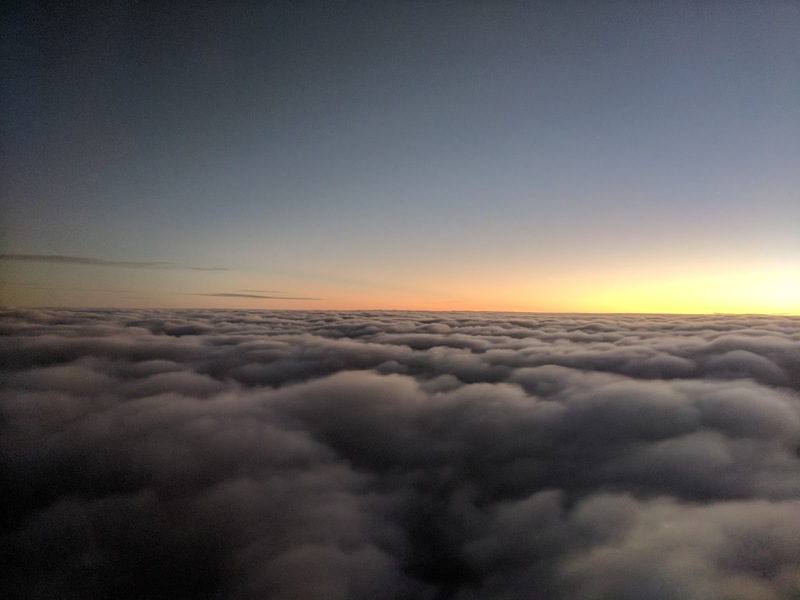 About ten minutes before boarding, an announcement was made, in Spanish only, that the flight was completely full, that storage for carry-on baggage was limited, and that all large carry-on items should be gate checked. It seemed likes hundreds of people took the advice, and several large baggage carts were filled. An orderly boarding process followed and we were on our way to Cuba. The flight was smooth, and we landed at Santa Clara airport which was very much more efficient that the Havana arrival terminal that I remember from our 2003 visit. It was interesting to watch the inspection dogs walking along the luggage conveyor belts smelling each suitcase as it went by. My bag was one of the first off the plane and passing through customs was quick and easy. Experience Plus [the tour operator] had arranged for a shuttle to get me to our starting point, the small city of Remedios. After changing some money into Convertible Pesos (CUC’s, pronounced “kooks”), I began looking for the shuttle driver. After some initial confusion, I found him and three others of our group who had come in on the same plane. We had about a one-hour taxi ride to Remedios, arriving just as the main body of the group were about to start dinner. After a good fish dinner, I retired early at 8 pm, tired from the overnight travel. Unfortunately, my room did not have hot water, so I had to shower in water that was barely lukewarm.